PARK SLOPE — When parents christened P.S. 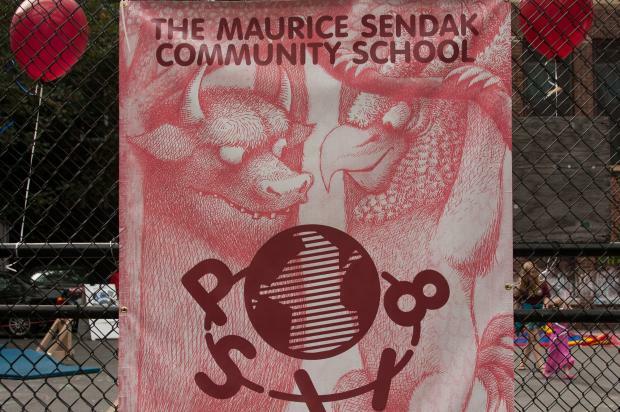 118 the Maurice Sendak Community School, they hoped to infuse the new school with the author's creative, inclusive spirit. What they didn't anticipate was the windfall the name would bring. Since the school's opening this fall, the Maurice Sendak Foundation has provided both moral and financial support that's been a shot in the arm for P.S. 118, a fledgling school created during last year's controversial rezoning of District 15. Most recently, the school received a surprise $5,000 check from the foundation. But the relationship goes far beyond money, said Principal Elizabeth Garraway. "They have, in essence, made us like family — that’s how it feels," Garraway said. "It's more than money — money can't represent the care and investment that they're giving to us. We have this partner who really wants to see us succeed." Members of the foundation's board of directors attended the school's ribbon cutting, and so did the foundation's "fellows" — artists who spend time living and working on Sendak's Connecticut property. The foundation has invited the school's PTA and staff to visit the location. The foundation has also given the school permission to use copyrighted Sendak images on its website, and on banners outside its building on Eighth Street and Fourth Avenue. Later this year, the school will hang original Sendak sketches donated by the foundation in its library. At the foundation's suggestion, Harper Collins gave 100 books to the school, 35 of which were Sendak titles. The Sendak Foundation initially allowed P.S. 118 to use the author's name because its pre-K through fifth grade students are Sendak's "primary audience," said board member Michael di Capua. Also, the school is in Sendak's home borough — "a classier part of Brooklyn than where Maurice grew up, but still Brooklyn," di Capua said. But since then, foundation board members have been impressed with the extent to which the school has embraced the "Where the Wild Things" author, who passed away in 2012. "What they're doing really is an honor to Maurice's memory," said di Capua. "We feel it’s much more than a superficial, cosmetic, slap his name on the front of the building thing. It really means something, so we want to support it." Students read Sendak's books in both Spanish and English, make puppets modeled after his characters, and use cubbies adorned with his "Where the Wild Things Are" monsters. In the pre-K class, teacher Annie Giovino helps children learn the months of the year with daily songs from Sendak's "Chicken Soup with Rice." Sendak's highly original vision is in line with the school's overall philosophy, Giovino said. "We're trying to give children the abilities they need to be lifelong learners," Giovino said. "The fact that he was an author and he created these imaginative books, that's what we're going for too. [We're telling kids] to be yourself, to be your own person." Garraway said the Sendak Foundation's support has felt like "a vote of confidence" for P.S. 118's administrators and parents, who've been determined since day one to create a school as desirable as its sought-after neighbor, P.S. 321. Many P.S. 118 were originally zoned for P.S. 321, and some had moved to the neighborhood — and bought pricey housing — specifically so their children could attend the prestigious school. Among them are P.S. 118 parent Tina Chang, who squeezed her husband and two children into a too-small apartment for several years so she could send her children to P.S. 321. Getting zoned out was a "frustrating shock," but she and other families have more than bounced back since then. In some ways, the Sendak connection played a role in helping her family embrace the school, said Chang, who is Brooklyn's poet laureate. She considers Sendak one of her literary heroes, and regularly puts her children to bed with a reading of "In the Night Kitchen." Her son Roman, a pre-K student, was shy about entering the classroom, but seeing Sendak images at P.S. 118 provided a sense of familiarity that helped him come out of his shell, she said. At a recent parent-teacher conference she was pleasantly surprised to hear that Roman has " wonderful leadership qualities." Chang said she appreciates Sendak's unsentimental take on childhood — he once said that children aren't fragile, they're tough, because childhood isn't easy. "'Where the Wild Things Are' isn't about making friends or sharing [like typical children's books]," Chang said. "It introduces the difficulties of life. One of them is venturing out on your own, one is finding your own voice." That theme should resonate with P.S. 118 parents. Attending the school was a leap of faith into the unknown, Chang said. "The parents have a very adventurous nature. We're all in it together. We all know we have to participate to make it grow into the school we want it to be." Di Capua, who was Sendak's longtime editor on books such as "Where the Wild Things Are," said Sendak Foundation board members have been impressed with the fierce commitment of parents and administrators. "There is such a strong, positive vibe about what is happening at this school, it seems like it's almost too good to be true, the way the administration and parents are building this from the ground up," di Capua said. "Maurice would have been very pleased."